The farm of ‘Rodokalo’ on Mount Oiti is situated at an altitude of 850 meters at the boundary of the ‘Oiti national park’. The land was used for growing vegetables for almost 100 years and then as grassland for farm animals. On the farm exists a plantation of fruit trees, vegetable gardens, a cistern with trout and spaces for goats and chickens, as well as some beehives. Finally there is a small house for permanent residence and small warehouses for storage of tools and materials. In March 2013, members of RurERG, after gaining some practical experience on small hydro installations by working along with small hydro designer and installer Richard Drover, undertook the project of powering the house and warehouses of the farm. In order to meet all the needs of the residents in electricity and hot water and since the property is located far from the main electricity grid and close to a stream that is running all year round, an off-grid pico hydro plant was designed. 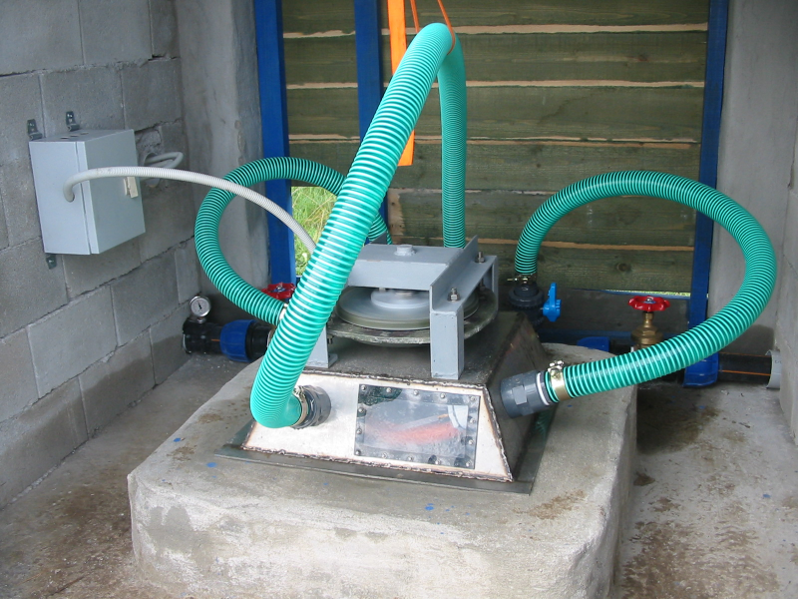 The system uses 4.5 l/s of water flow, which then drops down 18m of dynamic head through a 140m polyethylene pipe and drives the small hydroelectric plant. The turbine runner has been constructed by Joe Hartvigsen while the stainless steel casing was build in the workshop in Athens, following Joe’s plans from his website h-hydro.com. The generator is an axial flux permanent magnet generator of 500W rated power, designed and locally manufactured in the workshop of RurERG, following the construction concepts described by Hugh Piggott in his ‘Wind turbine recipe’ book. In this way, the energy of the moving water mass is converted into electricity which is then stored in a small 24V battery bank. With the use of an inverter, the system has the ability to meet all the needs of the house in electricity such as lighting, general appliances such as TV, radio etc, washing machine, fridge and freezer. At the same time, and due to the continuous operation of the pico hydro plant, all the surplus energy that is not consumed instantaneously or stored in the batteries, is used for heating water for the kitchen and the bath.